Anyleads is a lead generation solution which supports prospecting, content creation and B2B exchange tools for users to create automated email campaigns and marketing content, as well as find and verify emails using automated emails, templates, inbox automation functionality, Zapier integration, a REST API, and more. The Anyleads prospecting feature finds emails, then verifies them and sends automated campaigns to generate sales. With its drag and drop editor, users can create complex campaigns or simple scenarios with multiple follow-ups. Anyleads supports sentiment analysis and detects if a reply is negative, positive or neutral. It also allows users to add their own set of rules for matching a specific type of reply. With the Anyleads API, users can create, import, and update the entire Anyleads dashboard. Anyleads' content creation tools give users access to content including video subtitles from any niche that is ready to use and not indexed by Google. 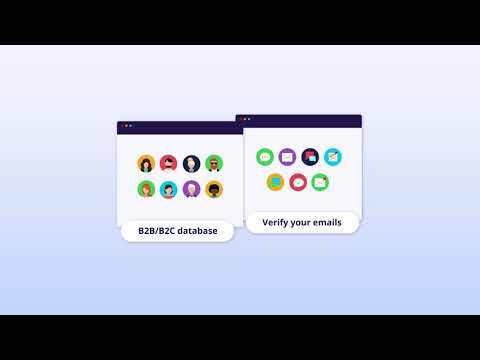 The B2B exchange feature lets users add and sync leads related to their business, video, or content in the software itself. Users can automate and connect Anyleads to their customer relationship management (CRM) system. Anyleads also supports Zapier integration and pushes new replies or contacts from a specific campaign to a specific folder. Anyleads allows my to find quantities of potential clients for my business. It's super effective. Their pricing is probably their biggest advantage, for a fixed price you get unlimited leads and they are constantly developing new features to increase the ways of getting new leads. They used to have an extension for Chrome which has disappeared. It was very useful in allowing me to gather contacts. • Includes a suite of growth hacking products and tools designed to help users accelerate their business. • Lets users install a tracker on their website to track information related to conversions from drip campaigns. • Offers a powerful editor that uses unique content and exports it directly into a PDF. • Anyleads allows users to build a highly targeted database of contacts and prospects them. • Users can utilize the Anyleads API to generate more leads and increase overall sales. Below are some frequently asked questions for Anyleads. Q. What type of pricing plans does Anyleads offer? Q. Who are the typical users of Anyleads? Q. What languages does Anyleads support? Q. Does Anyleads support mobile devices? Q. Does Anyleads offer an API? Yes, Anyleads has an API available for use. Q. What other apps does Anyleads integrate with? Q. What level of support does Anyleads offer?